Pet Skunk Message Board > Categories > General Chat > Overweight? First, let me say how amazing this forum is! I really appreciate being able to ask any strange skunk related question and get answers! Lorenzo is a big boy, about six months old. I read somewhere that there should be some fat over the first three tail vertebrae but then you should be able to feel bone after that. I've been using that as a guide for feeding him and his tail still feels fine, however, we just weighed him and found out that he weighs 16 lbs. Is it possible for a skunk to be healthy and weigh that much? We had no idea he was that big. These aren't the greatest pictures, but he's wrestling a stuffed dog right now, so it will be a bit before I can get better ones. He's happy and active in between his long winter naps. He still gets three meals a day (and cleans his plate every time) and no snacks. He gets lots of meat, bugs, eggs and a bit of fruits/vegetables and cheese. He loves cheese. If he is overweight, what's the best way to deal with that? Lorenzo is on the chubby side. The short triangular body style hides a lot of weight. Looking at his paws, head and tail, I would guess he should be 6 to 7 pounds at most at his adult weight. If he was born in April or May like most skunk kits, he is about to be 8 months. 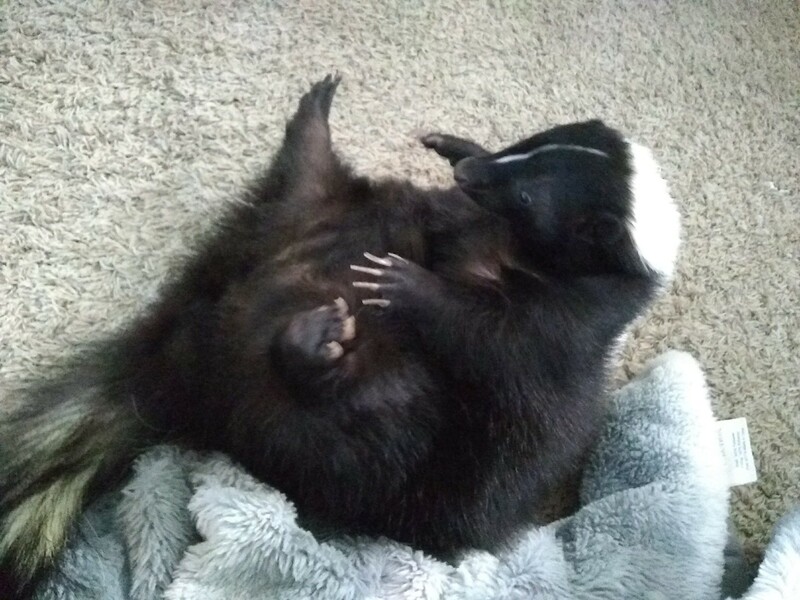 While some skunks reach adult size by 8 months, he could still grow a little more. Now is a good time to drop the 3rd meal. I would do 2 meals per day and offer a small snack instead of the third meal. After a week or so, drop the snack. Keep in mind, adult portions are much smaller than what one feeds a growing kit/junior. He's now on two meals + snack and is not happy about it. 😉 Does he need to go on a diet to get his weight down? Or will doing adult portions at two meals be sufficient? My Nibbles is 15 pounds and a year and 8 months old. He has just gained most of it over the last year. He is a long skunk though. I know he should probably be a bit lighter, but I think if he was below 10 he would be way to thin for his size. What should a skunk of his age weigh? He only gets breakfast and dinner, both small portions. Breakfast consists of a small portion of either pine nuts, Brazil nuts. Or hazelnuts, a small portion of either raw hukked sunflower seeds, or raw hulled pumpkin seeds. Every other day he either gets a small portion of veggies, or fruit. For dinner he gets a small portion of mixed veggies and some form of bugs. I have seen or had a handful of very large males in the last 35 years but even the largest wasn't more than 12 to 13 lbs. Rocky was our largest skunk. He was 3 feet long from neck to base of his tail. He towered over the other skunks. Our smallest skunk could walk under him without ducking. From what you describe, you are feeding mostly plant-based foods. Nuts are great as snacks but cannot replace a species appropriate diet. 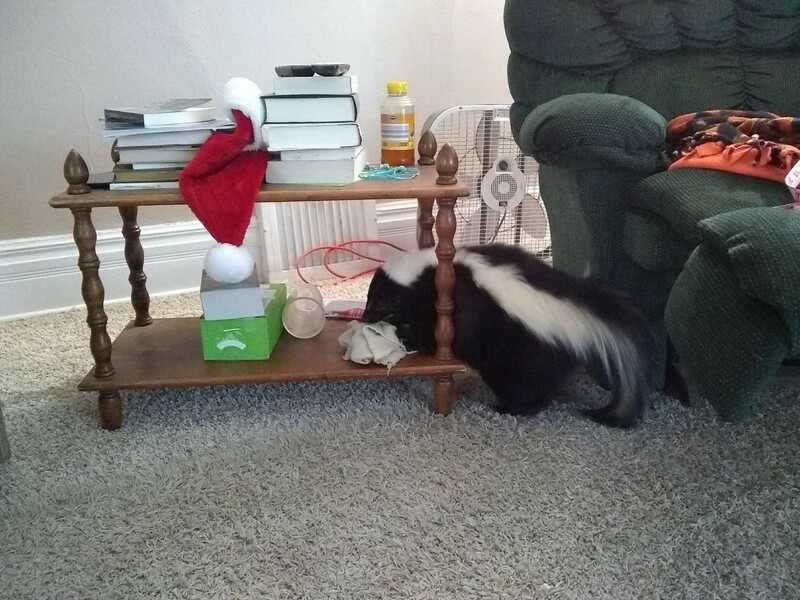 Skunks are fat for the following reasons: the wrong food, the wrong portion or both wrong food and wrong portion. In very few cases (almost none) there may be a medical condition contributing to obesity. The medical condition would likely be caused after years of feeding an incorrect diet. 50% of his diet should be feeder insects. You can mix live and dried. Portion is 1 to 1.5 tablespoons. The other meal should consist of a small portion of raw or freeze dried food that high in protein and fat and very low in carbs. The portion is about half of what one would feed a dog of the same size. Low carb vegetables can be given as an occasional treat as can low carb fruits like a cherry tomato or nickel size piece of avocado or a teaspoon of berries. It is fairly easy to maintain a normal body weight when the skunk is still growing. Unfortunately, they don't notify us when they stop growing and by then the owner has established feeding habits that will cause quick weight gain. I can't say how large he should be since I haven't seen him. I think it is unlikely that 15 lbs is normal for him. If you want to increase his chances at a normal, healthy lifespan, you need to rethink what you feed him. There is no portion of the high carb diet that you are currently feeding that will maintain weight without starving the animal of macronutrients. It will take millions of years for an animal's evolutionary diet to change so the owner needs to make the adjustment and feed a species appropriate diet, not the skunk.